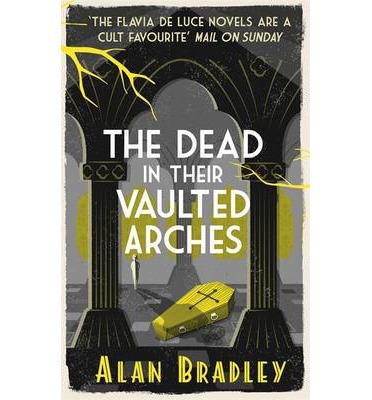 The Dead in their Vaulted Arches is the sixth volume in Alan Bradley’s wonderful mysteries featuring the intrepid sleuth Flavia de Luce and completes a story arc first begun in The Sweetness at the Bottom of the Pie. But don’t fret, there is still more to come from Bradley’s pen and a tv adaptation in the works. Because, of course, we can’t get enough of Flavia. The story arc in question is the mystery surrounding the disappearance and supposed death of Flavia’s mother Harriet, who was rumoured to have crashed in the Himalayas 11 years ago. But Harriet’s body, preserved in the Himalayan ice, has been found and finally she is coming home to be buried amongst her family. For Flavia, this brings as much joy as sorrow as she has little or no memory of her beloved mother. As Harriet returns to Buckshaw, all manner of people start turning up, from Winston Churchill to more suspicious figures as well as Flavia’s scary Aunt Felicity, Harriet’s cousin Lena and her equally strange daughter Undine, who may or may not be as capricious as Flavia. Amidst the dismantling of her father’s carefully built grief, Flavia begins to notice that there are several discrepancies in the account surrounding her mother’s death. What exactly was Harriet doing flying her plane into the Himalayas in the middle of war and leaving behind three small children? And who was she trying to warn in the film Flavia happens to find by chance, one of the last recorded memories of her mother? As the de Luces and almost everyone of importance descend upon Buckshaw to bid Harriet farewell, Flavia begins to realise that the long arm of the war is still reaching out for her and that there are still things about her family which will surprise her. Finally, we will find out what happened to Harriet. Unlike the other mysteries in the series, this volume is the conclusion of a story told in the last five volumes and not a stand-alone. Although I’ve wanted to know what happened to Harriet since volume 1, I did feel there could have been a little more mystery and substance to the story rather than it being solely a conclusion with an introduction to further mysteries for Flavia (which sound really exciting though!) I don’t want to give anything away so you’ll just have to read it, and although this isn’t my favourite episode in Flavia’s colourful history, it’s still a necessary part, just to offer some closure and I’m glad Flavia finally got to see Harriet again. However, I did wish there was more of a motive and explanation and back story behind Harriet’s tale, which would make fascinating reading and I do hope Bradley would consider writing some short stories with Harriet as the protagonist. I love Flavia but her mother is fascinating too. One of the strongest things about Bradley’s series is the notion of family in its myriad incarnations from blood ties, honour, loyalty and love to its more ugly side, jealousy, envy and hate. The characters that people the quintessentially English village of Bishop’s Lacey are colourful, compassionate and often full of surprises as are those in Flavia’s family including their faithful retainer Dogger, suffering from shell shock, and whose history we uncover a little more in The Dead in their Vaulted Arches. I can’t wait to read the next book in the series. Hurry! I’ve mentioned before my passion for poisons and my special fondness for cyanide. But, to be perfectly fair, I must admit that I also have something of a soft spot for strychnine, not just for what it is, but for what it’s capable of becoming. Brought into the presence of nascent oxygen, for instance, these rather ordinary white crystals become at first rich blue in colour, then pass in succession through purple, violet, crimson, orange and yellow. A perfect rainbow of ruin! Aah Flavia de Luce. I’m not sure whether there are very many protagonists who have managed to grasp so many hearts in their competent little hands. 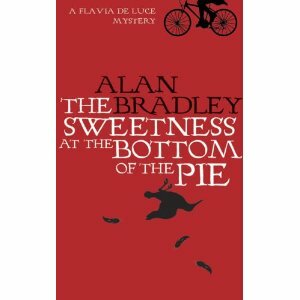 With her introduction in The Sweetness at the Bottom of the Pie, Alan Bradley has created a veritable tour de force of ingenuity coupled with such lovableness that sometimes I wish I was Flavia with her crazy family, crumbling country pile and an abandoned Victorian chemistry lab to die for. In Speaking from Among the Bones, Flavia is almost twelve and, together with the rest of the village, is eagerly awaiting the unearthing of St. Tancred who is said to be buried in the parish church of Bishop’s Lacey. But when the body of the church organist is found dead inside the organ and weird goings-on are uncovered in the tunnels beneath the church, Flavia sniffs a rat. Or a bat. Using only her wits and her prodigious knowledge of poisons, Flavia vows to uncover the mystery behind the suspicious death and search for the legendary diamond, the Heart of Lucifer, which may spell the end to her family’s financial troubles. For Buckshaw, her beloved home, has been put on the market and they may have to let it go. There is also the matter of the enigmatic Magistrate Ridley-Smith and his strange son who live in the next village and who Flavia’s deceased mother, Harriet, once knew. What’s with all the secrecy and why won’t anyone talk about them? Flavia is back on form in her fifth adventure, navigating her way through tricky familial politics with her sisters Feely and Daffy, her still-grieving father’s financial woes, making new friends with a flora-archaeologist and renewing her acquaintance with the solemn Inspector Hewitt and his beautiful wife Antigone. And there’s also her touching friendship with Dogger, the family handyman who had fought alongside her father in the Great War and who still suffers occasionally from his ‘episodes’. I did not mention that I kept this gripping reference on my bedside table as a midnight comforter. I love the gap between Flavia’s emotional naiveté and her piercing intellect, the way she is so wrapped up in unraveling her mysteries that she often misses what is going on in the lives of the people around her. And the touching way she craves recognition as only a child does. I keep saying this each time I read one of Bradley’s mysteries but I do urge you to give them a try. They’ve often taken me out of a reading slump, comforted me when things are blue and have made me laugh on the dreaded commute. Bradley’s comic touches are spot on, rounding the harsh lessons of evil, tragedy and murder. And do start with the first in the series just so you get a feel for the community in Bishop’s Lacey as the books do follow a loose chronological order. Although it is pleasant enough to think about poison in any season, there is something special about Christmas, and I found myself grinning. In Flavia de Luce, Alan Bradley has created an inquisitive little sleuth with a love of chemistry rivalling that of Sherlock Holmes. It’s always such a pleasure to read about her antics. 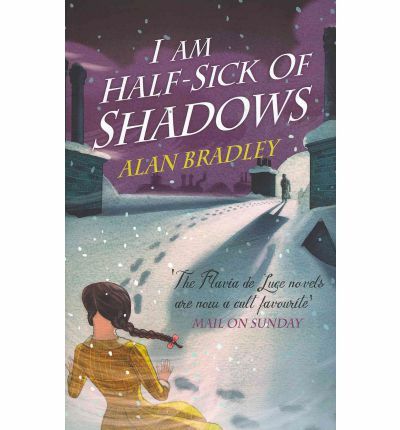 In the fourth book in the series, I Am Half-Sick of Shadows by Alan Bradley, it is almost Christmas and Flavia is busy plotting how to trap Santa Claus to discover his existance once and for all. However, Flavia’s father, Havilland has let a part of Buckshaw, their ancestral home, to a cinema crew for lucre to pay the taxman and as Buckshaw is turned into a film set, the stage is set for murder. For Phyllis Wyvern, the grand-dame of British film is found dead in her room by Flavia after a dramatic charity performance of Romeo and Juliet for the parish church, St. Tancred’s. As the snow has been piling up, all the guests have had to remain at Buckshaw and are suspects. Flavia is determined to find out whodunnit before Inspector Hewitt and goes about her investigations undercover. Will she unravel the mystery? And can she keep herself out of trouble? And can she trap Father Christmas? Once again it’s a cosy country house mystery with the added bonus of seeing Flavia’s interactions with her father, still grief-stricken after his wife Harriet’s demise in Tibet, her two sisters Feely and Daffy who seem to be always finding ways of hurting her and of course, Dogger, their faithful retainer still racked by memories of the war but who is more than what he seems. 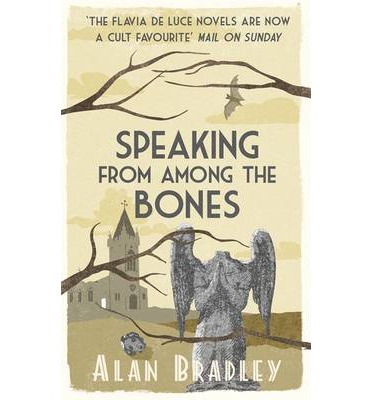 I love this series with Bradley’s signature playful prose and can’t wait to read the next book, Speaking from Among the Bones, which is due out next year. And apparently the series has been optioned for TV by none other than Sam Mendes’ production company. YAY. A big thank you to Orion Books for kindly sending me a copy of this book to review. Flavia de Luce is surely one of the most intriguing characters that has appeared in fiction in recent years. If you haven’t encountered her before, you are in for a treat. In Flavia, Alan Bradley has created a heroine who is enterprising, fearless, inquisitive and utterly adorable. She has an encyclopedic knowledge of chemistry, knows how to make toast using a bunsen burner, uses her fierce intellect in helping solve crimes committed in her village of Bishop’s Lacey and is all of 11 years old. 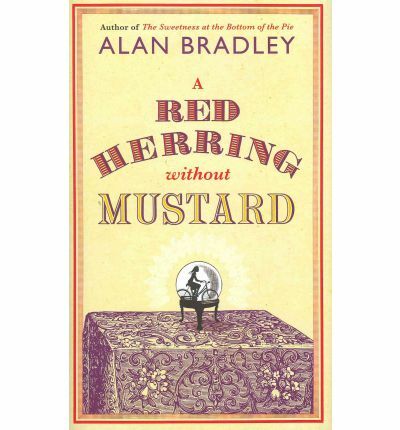 A Red Herring without Mustard is the third book in Alan Bradley’s series after The Sweetness at the Bottom of the Pie and The Weed that Strings the Hangman’s Bag set in 1950s England. Here we are re-united with Flavia’s family, her self-absorbed father Colonel de Luce, her two elder sisters, beautiful Ophelia (Feely) and bookish Daphne (Daffy), Mrs. Mullet the cook and Dogger, their faithful retainer suffering from post traumatic stress disorder after his experience in the war. At the village fête, Flavia meets Fenella Faa, a gypsy who once knew her mother Harriet and who had fled Bishop’s Lacey twenty years earlier after the disappearance of a child and who is later found lying unconscious in a pool of her own blood. The body of one of the dodgier residents of Bishop’s Lacey is also found strung up from Poseidon’s trident in one of Flavia’s fountains. And there is the mysterious business of missing antiques. While looking for clues, she stumbles upon a forgotten religious sect at the heart of Bishop’s Lacey. And Flavia meets Fenella’s niece, Porcelain, and makes a friend. As she investigates the weird goings on in her village, Flavia once again tries to stay one step ahead of the dashing Inspector Hewitt while trying to keep her nose clean. But will she be able to stay out of trouble? And what if trouble comes to find her? This is a much stronger novel than the second volume in the series and once again I laughed out loud at the little jokes and felt touched by Flavia’s family’s need for their dead mother, all shown in different ways. The banter between the sisters is barbed as usual although we do get to witness some instances of sibling unity and a quietly touching scene between Flavia and her father. I also found Porcelain to be an intriguingingly Dickensian urchin and hope she turns up in further adventures. And what a lovely name! Bradley’s series never fails to remind me of why I love reading. It’s funny, eccentric and with just the right touch of menace. Thank you very much to Orion Books who kindly sent me a copy of this book to review. You may remember how excited I was at finally getting acquainted with the lovely, lonely, eccentric, resourceful and chemistry-mad Flavia de Luce in Alan Bradley’s The Sweetness at the Bottom of the Pie. Any girl interested in science gets my vote big time. 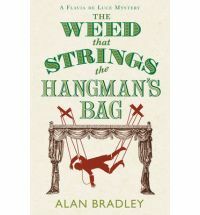 So I was equally excited but slightly apprehensive about reading Bradley’s second offering The Weed that Strings the Hangman’s Bag because there have been some mixed review. Granted, it didn’t emulate the same sense of wonder at reading the first book because there you were introduced to the de Luce clan and the other inhabitants of Bishop’s Lacey, but I really enjoyed reading it. It’s cosy, familiar and makes me feel all warm and fuzzy inside, like I’m meeting an old friend again. In The Weed that Strings the Hangman’s Bag, Bishop’s Lacey gets a visit from a renowned BBC puppeteer Rupert Porson and his flame-haired assistant Nialla. Their van has broken down and Flavia stumbles across them near the village church. The Vicar arranges for them to stay with the Inglebys at Culverhouse Farm and convinces Porson to do a show for the village. But in the midst of the show, Porson is killed and Flavia must once again use her wits to find the killer. Bubbling under the shadow of the murder is an earlier tragedy of the death of five year old Robin Ingleby who was found hanging in the woods. What is Rupert Porson’s connection with Robin’s father and who amongst the inhabitants of Bishop’s Lacey is devilishly clever enough to kill Porson? The story is set in the 1950s with Bishop’s Lacey still recovering from WWII. Although I’m a huge fan of historical mysteries, I liked that Bradley’s novel didn’t weigh you down with too much historical facts. Apart from the presence of a German POW and a land girl helping out at Culverhouse Farm and a wonderful touch where a television is introduced into the de Luce household, you can almost forget the period in which the novel is set and concentrate on the eccentric characters that populate Bishop’s Lacey. In a way it is reminiscent of the Golden Age mysteries set in the land of yore (so comforting and so familiar, isn’t it?) I just love Flavia’s family so I have no complaints. I, for one, will be looking forward to reading more from Alan Bradley and finding out more about Flavia’s adventures! Many thanks to the lovely people at Orion who kindly sent me a copy to review. Can I just say, I loved, loved, LOVED this book. I’d heard many good things about The Sweetness of the Bottom of the Pie by Alan Bradley and it’s sequel The Weed That Strings the Hangman’s Bag, with lots of great reviews dotted here and there, and was over the moon when I pounced upon it at my library. Of course, it had been reserved but I kept it back for a few days to read it (sorry!) And boy am I glad I did. Flavia de Luce is a true heroine, all 11 years of her: she’s plucky, intelligent, independant and gives as good as she gets (especially to her two elder sisters Ophelia and Daphne with whom she is perpetually at war). She is the proud master of her very own chemistry lab and an expert in poisons. I’m more an astrophysics person myself but even I was drooling over the perfect lab stocked by Flavia’s science-mad Uncle Tarquin where Einstein and Shaw had once taken tea (separately). What more could you want in a main character? The Sweetness at the Bottom of the Pie begins with Flavia bickering with her sisters when a dead bird is delivered to their door with it’s beak through a stamp. Flavia’s father is a keen member of the philatelic society and was once embroiled in a school scandal resulting in the death of a master. A mysterious midnight visitor and a corpse in the morning leads to all sorts of mayhem as Mr. de Luce is promptly arrested for murder. To save her father, Flavia hunts for clues and delves into the past uncovering a story of greed, poisonous friendships and the most elusive and prized stamp of all, the Penny Black. And throughout this, we meet all sorts of characters who populate the village of Bishop’s Lacey including Flavia’s trusted bicycle Gladys. I learned quite a bit of chemistry reading this novel and Flavia’s bookshelf reminded me of some of the books I encountered as a student. Amongst other juicy bits of trivia, I also learnt that the essential plant oil urushiol was used to make lacquer and it clicked that in Japan, we call lacquerware ‘urushi’. I can’t wait to read the sequel, The Weed that Strings the Hangman’s Bag (and there’s promise of six books in the series! ), and am even contemplating buying The Sweetness at the Bottom of the Pie just so I can keep it and read it again and again. I think I love this book too much. Just in case you think it’s all sugar and spice (because I’m gushing too much), Bradley’s novel harks back to the golden age of mystery but with a blanket of darkness and menace. Just how I like it. I read this as part of the Thriller and Suspense 2010 Challenge .